So, the FCPX Creative Summit *just finished* it's third year...and I don't know if I can top the experience next year. There are always high moments (and some low ones) at any conference. While I loved the people and sessions - in this case, it was Apple that blew me away. When talking about tech companies, especially around pro video, some of them are very open...while others play their cards close to the vest. Our group walked into Town Hall at Apple - the place where Steve announced the iPod. No NDAs were signed. Five times (including twice out of my own mouth) we were told NO PICTURES. Cool, we had some inside information. No pictures please. Then they said, outside, in a demo area were iMac Pros - with 10.4 and....YES WE COULD TAKE PICTURES. I had to go and get verification. Because I couldn't believe it. I'm sharing this one - I'm going to dig into others (if you have any, please share it) and write an article or two. Now, I've always been proud of the programming. I've managed to ge the top educators and workflow experts of FCPX in one place. Apple gave me a problem, though. How do I top this? 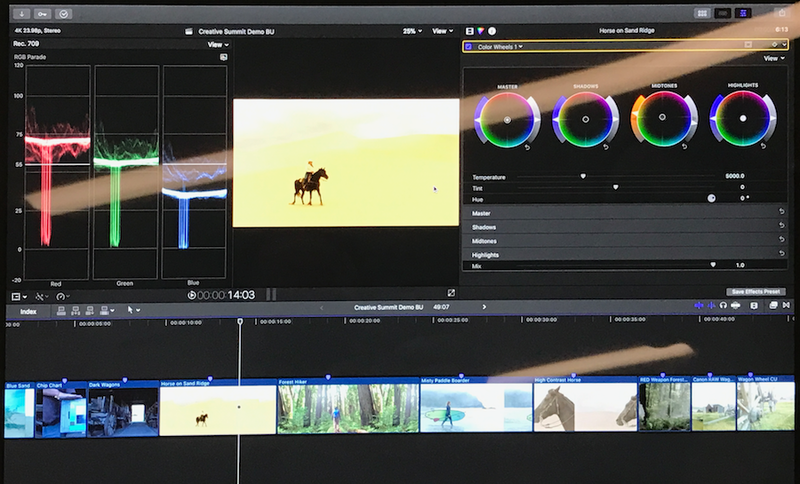 In 2017, Apple showed us FCPX 10.4 before it's release. Do you really want to miss what they do in 2018? Yes, I'd love for you to sign up for my mailing list here - but you don't have to.